Earth Showerhead SpecialEarth Showerhead SpecialsGreat Showerheads at a Great Price. 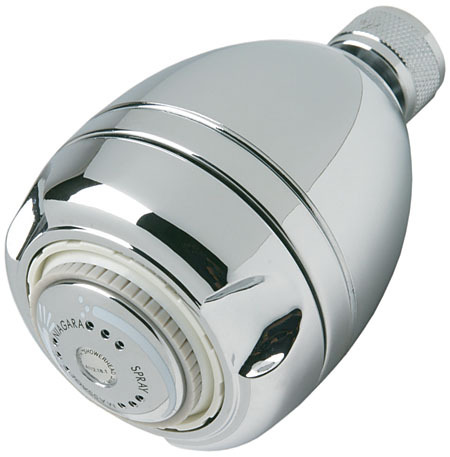 Get a Great Showerhead at a Great price! "We are a water and energy conservation company that meets the needs of our customers today!" The Earth™ Showerhead - Get a great shower and efficiency into any bathroom with the Earth showerhead. 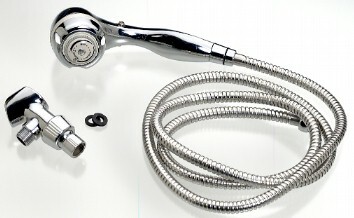 Rated #1 showerhead in USA by leading industry magazine. Features include; 9-Jet Turbo Massage - Forceful to Gentle, relaxing massage mode, adjustable spray and pressure, responsive flow control, 10 year Warranty, self cleaning, installs easily by hand and without tools. Certified California Energy Commission 2.5gpm. 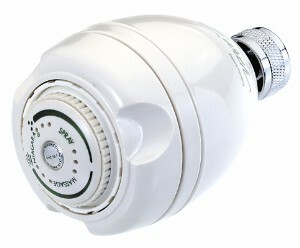 In White finish.. Actual Size: 2-1/2" x 3-3/4"
NS2920 White 2.0gpm out of stock call for quantity. All Handheld Showerheads - Combines ergonomic luxury with peak performance. Flow control technology: greater force at lower pressure! * Conserves water and saves money while enhancing pressure, performance, appearance and luxury! * Saves 20% more water and energy than a standard 2.5 GPM showerhead - that’s 3,650 gallons of water annually! I just HAVE to thank you. The adapters worked perfectly, so I am now able to use the portable dishwasher I got for $50. I have 5 teenagers and cannot describe what a lifesaver this is for me. And thanks again for noticing my double order AND the quick refund. You have a stellar business! Hard to find find item, thanks for getting me the exact part I needed quickly. "Item arrived quickly and in said condition. All I had to do was screw the hose on and it has been working great since I installed it a couple of weeks ago." "What a great shower head. Nothing shy of the ones selling for four times as much over at Wal-mart. Came with screen and washer, similar to a washing machine connection for Debris free operation, no over tightening or tape sticking out under the threads... if you've ever done any plumbing you know how unsightly Teflon tape looks on your plumbing.. I got one for each bath. " From Sue - "Alexandria, KY"
We got an Earth showerhead from our utility company when they did an inspection of our home to help us save energy. It is amazing! We've looked in all the standard places (Home Depot, Lowe's, etc.) tried their "water savers." What a joke, I hated them. When I went to the internet and found you, I was elated! I'm ordering the 2.0 with the soak 'n' soap feature. I never liked it that the water just went down the drain while soaping, shaving, etc. Now it won't! Thank you for your products! From Tyler D. -"Port St. John, FL"
"After swapping out my old 2.5gpm shower head for the new Earth massage 1.5gpm one, I couldn't believe my eyes - I couldn't believe that I was using less, much less water although it appeared as if I was using more. The Earth massage's spray pattern felt better too, all in a nice compact design. I couldn't wait to receive the water Eco Kit. It's good to know that I'm not only saving on my water bill, but I'm also saving on my electric bill due to using less hot water. You have an excellent product line! I recommend this to anyone who not only wants to save on water and electric, but also to anyone who cares about their environment." "We stayed at a hotel in Charleston, WV on the way home from vacation. showerhead is wonderful, and I have told everyone I know about it". information so I may purchase them?" "We stayed at a Country Inn and Suites and when we used the shower it was exhilarating - Thank you for providing a great showering experience with the Earth Showerhead." using the Prismiere. It provides a steady, forceful and even water flow. located the showerhead at NRG Savers. to my request. Thanks again. O.K. let me tell you! I buy online and I sell on auction sites, I have bought 5 different shower heads trying to find one that really did what it said it did. I have a well so you can imagine the little spray that I get. I have lost a lot of money buying these darn shower head! BUT YOU! YOU ARE THE ONE! THE BEST! I don't want to even get out of the shower! I have never emailed about a good or bad product that I have received before, but this item is so wonderful I had to let you know how I felt. Also, I was trying to remember when I was ordering it I believe there was a section where it said "if you want this item shipped to another address" (if it wasn't you it was one of the junk shower heads) anyway I love this product so much I would like to add it to the items that I sell. all the shampoo/conditioner out of my hair and all the soap off my skin. should have this super water saver. From : Johanne, "Hallandale Beach, FL"
a lot more water pressure. It's a great product. From : Mike , "Seattle, WA"
Your aerator parts fit perfectly into the old aerator body from the faucet. Problem solved! Thank you for continuing to help me with getting this solved. I'll definitely recommend you guys to anyone looking for water-saver parts. have them I immediately ordered two. Thank you so much for stocking these shower heads. It is absolutely amazing that none of the big fixture companies can manufacture a product like this. I am sold and I will be back. When we have guest over they always praised the shower head and asked where they could get one. I will refer them to your site. Thank you, you have made my day! Thank you very much for your prompt reply and resolution of the issue. I really appreciate your help and look forward to making more purchases from your company. Just wanted to say thanks for your excellent customer service and how impressed I was on how quickly you handled my request. Just received the #NS335 Faucet adapter. worked great in adapting my faucet to the "C" pur water filter adapter. The "A" adapter has been a problem even after the upgrade. Prone to leaks and spraying. Thought you might want to put a note for others to benefit. Please Contact Us if you have any comments or questions. Thank You.